This is another great example of Social Media Viral Marketing at its best and WII-FM (What’s In It For Me). I am often asked when I speak, “How can I create a video, blog, web site fish food, that will become viral and spread on its own?” The answer is always WIIFM. There always has a “What’s In It For Me” or “What’s In It For Your Customer”. 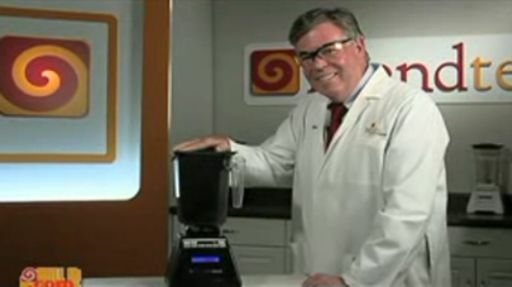 In many cases it’s a white paper with value, a take-away, or in this case the WII-FM is humor or entertainment.In this video Tom Dickson, President of BlendTech a manufacturer of consumer blenders blends a brand new iPhone! “The Will It Blend” series started when the night before Tom was about to release his new line of consumer blenders, he went into engineering to test the durability of his new product. The most common cause for blender motor failure is blending ice for Margarita’s. So the key to a successful blender is a strong motor. When Tom walked into engineering, he realized that it was after 5:00 PM and everyone had gone home for the day. Tom took a blender from the shelf and looked for something to place in the blender to test it. Not being able to find anything suitable, Tom opened an exit door to the outside and found a rake that had been left by the lawn care people earlier that day. Tom removed the cover of the blender, turned it on high, and inserted the wooden handle of the rake into the spinning blender. Within a few minutes the rake whittled was down to its tines and engineering was full of wood chips. Satisfied of the blender’s power, Tom went home. The next day when the engineers entered the lab, they saw wood chip carnage. When they found out what Tom had done, they asked to see him do it again. Tom took rake #2 and preceded to puree the 5’ wooden handle, only this time someone from P.R. videotaped this demonstration on a hand held video camera. Later that day he uploaded the video to YouTube just for fun and within 24 hours, the video had been viewed by more than 1,200,000 potential customers and BlendTech sold out their entire inventory blenders! What would you pay to have your company’s product or service 1 ½ minute commercial viewed by over one-million potential customers in 24 hours? You most likely couldn’t afford this kind of media exposure. This video has now been viewed more than 3,500,000 times. The video link below is Tom blending a brand new iPhone on the day the iPhone came out. For more videos of Tom blending crazy things such as; diamonds, pens, golf balls, Barbies, glow sticks, cell phones, his famous rake, and more, go to YouTube.com and search on “Will It Blend”.